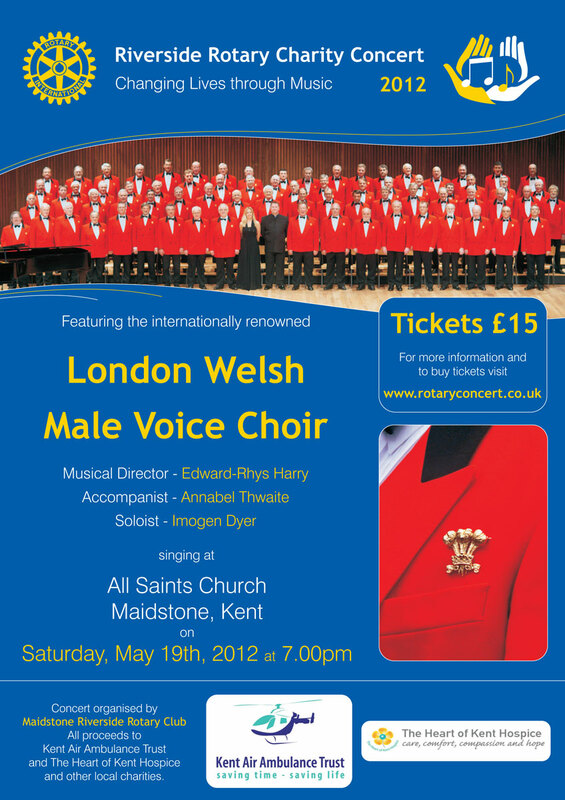 The internationally renowned London Welsh Male Voice Choir will be singing at All Saints Church, Maidstone on May 19th, 2012 in a charity concert. The event is called ‘Riverside Rotary Charity Concert 2012 – Changing Lives through Music’ and has been organised by Maidstone Riverside Rotary Club. All the proceeds will benefit two Kent-based charities – Kent Air Ambulance and Heart of Kent Hospice, as well as other local charities. Tickets are only £15 and can be purchased online at http://www.rotaryconcert.co.uk; website visitors can also find about the history of the choir and listen to samples of recent performances. The choir will be conducted by Musical Director, Edward-Rhys Harry and accompanied by concert pianist, Annabel Thwaite and feature soloist, Imogen Dyer. The London Welsh Male Voice Choir was formed in 1961 and has over 100 members. The Choir has sung at venues around the world and at many of Britain’s most prestigious concert halls, cathedrals and sports stadia. It has had the honour of appearing twice at the Royal Variety Command Performance, and in Gala Concerts to celebrate the fiftieth birthday of the Prince of Wales and the fortieth anniversary of Her Majesty’s accession to the throne. In contrast, the Choir was the backing group to the pop band Take That at Earls Court and has recorded with Charlotte Church, Aled Jones and Bryn Terfel. Its 1981 recording, Songs of the Valleys, is believed to be the first album by a male choir to achieve a gold disc for sales in excess of 100,000. The Maidstone Riverside Rotary Club is proud to be supporting two of Kent’s best known local charities. The Heart of Kent Hospice is a local charity specialising in providing expert palliative care and support to people facing the challenge of terminal illness. The Kent Air Ambulance responds swiftly to 999 calls. The highly skilled specialist doctors and critical-care paramedic take to the scene the type of expertise and equipment you would normally only find in a hospital’s emergency department, from where they can transport the patient to the most appropriate hospital for their needs. This entry was posted in Rotary Club of Maidstone Riverside. Bookmark the permalink.